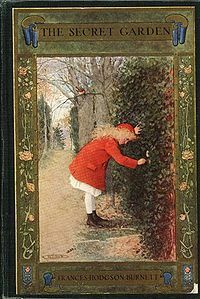 For several weeks during the fifth grade our teacher read aloud to us from The Secret Garden, by Frances Hodgson Burnett. She read right after lunch, so I would rush from home back to school after eating to get settled in before she started. I was reminded of that experience today after coming across a blog post from Oxford University Press on the topic of children’s literature. Listening to our teacher read from The Secret Garden is one of the highlights of that year; in fact, it is the only thing I remember, besides getting under our desks for bomb drills—as if a desk would have provided even a modicum of protection if a nuclear bomb had actually fallen on us. I used to interlace my fingers across the top of the desk and lay my chin on them to listen to the story of Mary Lennox. Just thinking about it evokes sights, sounds and smells—chalk dust, Kenny Wilson’s perpetual sniffling, paper and books, the warmth of the afternoon sun as it came through the huge windows of the classroom. I was drawn into the story in such a profound way. Even now, I relish listening to books and poetry–especially poetry–being read aloud, if it’s being done well, that is. The problem is that some poets are not good readers which results in poetry readings that are not always the kind of experience I want them to be. Some readers miss the opportunity to connect with the audience, and thereby miss the opportunity to promote their work properly, or to do it justice. They are also missing the opportunity to create a memorable experience for the listener. A few years ago, I heard a very accomplished and famous poet, whose work I admire, read from her new book. By the time it was over, I was ready to go mad. She consistently started each line with a high-pitched tone that descended through the line, and always ended with a sharp up-swing of the final word. She did this without fail, line after line. Had this person never listened to herself read? For me, it was nothing short of listening to a singer sing off key. Why hadn’t a friend or her agent—yes, a poet with an agent—coached her? In a few weeks, I am going to do a poetry reading at the Santa Barbara Poetry Series so, lately, I have been thinking about my own reading skills. I want to make the experience rewarding for those who will attend; after all, they will be paying me the ultimate honor by listening to me read my poems. I believe that with a little effort, it is possible to develop a good reading style. Listen to how beautifully, Li-Young Lee reads his poem, “This Room and Everything in it.” Notice how slowly and intentionally Lee reads. The style is natural. It is a great model because it is hard to listen without getting every word—a worthy goal for a poet who has spent hours laboring over writing every word. Here are some suggestions on how to be a better public reader. If you have others, I hope you will share them in the comment section. Slow down while keeping a good pace. Avoid affected voices and styles. Avoid habitual reading patterns that are easy to fall into. It helps to record yourself reading and then to listen to it critically. By the way, this also even helps with editing. Often, the places where you stumble, need more work. Pause a bit between poems. Let the poem resonate for a minute or so before moving forward. This is something I became painfully aware of while watching myself on a video. Consider the order of the poems you are reading. You might start with a lighter, more accessible poem before diving into more complex work. Pick a good ending poem since the last thing you read might be the most remembered. Pick out the poems before you get to the podium. Nothing says, I didn’t give any thought to this performance or to my audience before I came here more than casually flipping through the book as if deciding what to read next. Give a very short introduction to each poem. This helps the audience transition between poems. I also think listeners like a little background. They can’t get that when they read the poems themselves so it’s a bonus. If the poem has an epigraph, my recommendation is to read the epigraph first, then the title. You can say something like, “This poem begins with an epigraph. . .”, then give the title right before you read the poem so listeners will connect the title with the poem. Try to look up as you read if possible. This is tricky because you can lose your place in the poem and that’s awkward. I keep my finger beside the line I am reading so, I can easily find my place should I happen to lose it. Also, if you have practiced enough, you tend not to lose your place. Most important of all—practice, practice, practice! Think of the reading as an artistic performance. Even if you are a better poet than performer, you can improve with practice. You owe it to those who give of their time to listen! This entry was posted in Poetry, Poetry Events, Poetry Readings, Uncategorized and tagged Grace Curtis, Li-Young Lee, Poetry, Santa Barbara Poetry Series. Bookmark the permalink. This is so terrific, Grace! Your suggestions are clear and so thorough–they should keep any poet from falling into the kind of rote-incantation style you describe. Thanks Leslie! Nothing is worse is it? Thanks Kathleen. I am trying to get better each time I do it. Really smart post, Grace. You’re a very good reader in all of these ways because you a) write very good, interesting, surprising poems and b) you pay attention to people, those out there listening. David, Thank you so much. That means a lot coming from you. I remember a reading you gave once where you projected art on a screen behind you. What a great idea! I am thinking more and more that multimedia presentations are the way to go. Look at what poetry, and I am not referring to performance poetry, is competing with. There is so much available. That is why I appreciated what you did. I also like the idea of combining music, visual art and poetry into a single evening event. So much opportunity.